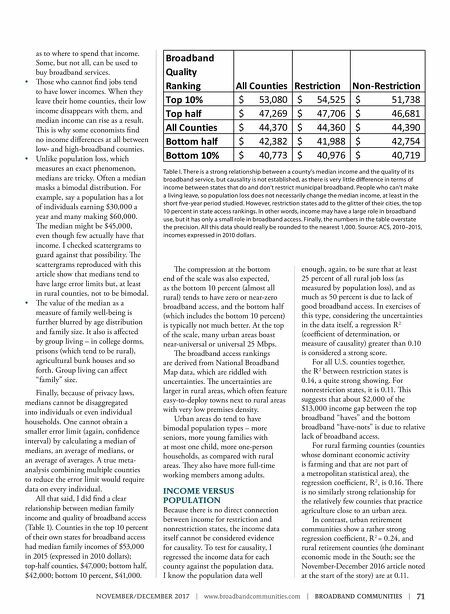 NOVEMBER/DECEMBER 2017 | www.broadbandcommunities.com | BROADBAND COMMUNITIES | 71 as to where to spend that income. Some, but not all, can be used to buy broadband services. • ose who cannot find jobs tend to have lower incomes. When they leave their home counties, their low income disappears with them, and median income can rise as a result. is is why some economists find no income differences at all between low- and high-broadband counties. • Unlike population loss, which measures an exact phenomenon, medians are tricky. Often a median masks a bimodal distribution. For example, say a population has a lot of individuals earning $30,000 a year and many making $60,000. e median might be $45,000, even though few actually have that income. I checked scattergrams to guard against that possibility. e scattergrams reproduced with this article show that medians tend to have large error limits but, at least in rural counties, not to be bimodal. • e value of the median as a measure of family well-being is further blurred by age distribution and family size. It also is affected by group living – in college dorms, prisons (which tend to be rural), agricultural bunk houses and so forth. Group living can affect "family" size. Finally, because of privacy laws, medians cannot be disaggregated into individuals or even individual households. One cannot obtain a smaller error limit (again, confidence interval) by calculating a median of medians, an average of medians, or an average of averages. A true meta- analysis combining multiple counties to reduce the error limit would require data on every individual. All that said, I did find a clear relationship between median family income and quality of broadband access (Table 1). Counties in the top 10 percent of their own states for broadband access had median family incomes of $53,000 in 2015 (expressed in 2010 dollars); top-half counties, $47,000; bottom half, $42,000; bottom 10 percent, $41,000. e compression at the bottom end of the scale was also expected, as the bottom 10 percent (almost all rural) tends to have zero or near-zero broadband access, and the bottom half (which includes the bottom 10 percent) is typically not much better. At the top of the scale, many urban areas boast near-universal or universal 25 Mbps. e broadband access rankings are derived from National Broadband Map data, which are riddled with uncertainties. e uncertainties are larger in rural areas, which often feature easy-to-deploy towns next to rural areas with very low premises density. Urban areas do tend to have bimodal population types – more seniors, more young families with at most one child, more one-person households, as compared with rural areas. ey also have more full-time working members among adults. INCOME VERSUS POPULATION Because there is no direct connection between income for restriction and nonrestriction states, the income data itself cannot be considered evidence for causality. To test for causality, I regressed the income data for each county against the population data. I know the population data well enough, again, to be sure that at least 25 percent of all rural job loss (as measured by population loss), and as much as 50 percent is due to lack of good broadband access. In exercises of this type, considering the uncertainties in the data itself, a regression R 2 (coefficient of determination, or measure of causality) greater than 0.10 is considered a strong score. For all U.S. counties together, the R 2 between restriction states is 0.14, a quite strong showing. For nonrestriction states, it is 0.11. is suggests that about $2,000 of the $13,000 income gap between the top broadband "haves" and the bottom broadband "have-nots" is due to relative lack of broadband access. For rural farming counties (counties whose dominant economic activity is farming and that are not part of a metropolitan statistical area), the regression coefficient, R 2 , is 0.16. ere is no similarly strong relationship for the relatively few counties that practice agriculture close to an urban area. In contrast, urban retirement communities show a rather strong regression coefficient, R 2 = 0.24, and rural retirement counties (the dominant economic mode in the South; see the November-December 2016 article noted at the start of the story) are at 0.11. Broadband Quality Ranking All Counties Restriction Non-Restriction Top 10% 53,080 $ 54,525 $ 51,738 $ Top half 47,269 $ 47,706 $ 46,681 $ All Counties 44,370 $ 44,360 $ 44,390 $ Bottom half 42,382 $ 41,988 $ 42,754 $ Bottom 10% 40,773 $ 40,976 $ 40,719 $ Table I. There is a strong relationship between a county's median income and the quality of its broadband service, but causality is not established, as there is very little difference in terms of income between states that do and don't restrict municipal broadband. People who can't make a living leave, so population loss does not necessarily change the median income, at least in the short five-year period studied. However, restriction states add to the glitter of their cities, the top 10 percent in state access rankings. 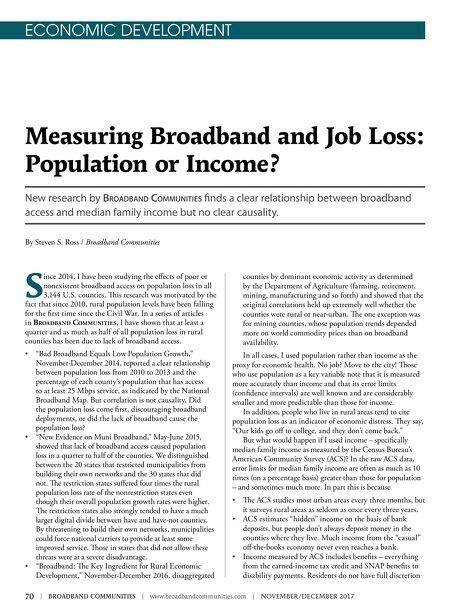 In other words, income may have a large role in broadband use, but it has only a small role in broadband access. Finally, the numbers in the table overstate the precision. All this data should really be rounded to the nearest 1,000. Source: ACS, 2010–2015, incomes expressed in 2010 dollars.